A slide from the March meeting showing a rough idea of what the Albany Skyway could look like. There's a public meeting May 22 at The Palace to talk about designs for the Albany Skyway project. Blurbage: "Capitalize Albany Corporation is hosting a second public community event in order to generate ideas that will support the project's design and engineering. Initial Skyway design concepts will be previewed at this meeting. ... Learn more about the future potential of the Skyway and share your priorities and design ideas." The Albany Skyway is a project to convert a relatively lightly-used off-ramp from I-787 to Clinton Ave in Albany into a pedestrian-bike connector/linear park between Broadway and the riverfront. The project got a big boost earlier this year when the Cuomo admin committed $3.1 million to it. Back in March there was a packed public meeting at which officials and the design firm Stantec outlined the project and gathered some initial input about what people would like to see happen with the project. This month the project team walked the ramp and surveyed views from it. This next public meeting is Tuesday, May 22 from 5-7 pm at The Palace. Capitalize Albany is asking that people pre-register (see the first link above). And Stantec, the engineering/design firm working on the project, is still gathering public input via an online survey. I have no problem with the Skyway and will probably use it. That being said, how do we get money to pave some roads around the city? Does anyone ever drive the streets and see the conditions? It appears the only way to get a street paved around here is to hope National Grid puts in new gas lines so they'll do it. The Palace Theater is to undergo a $65 million dollar renovation and expansion. A new 600 seat theater is part of the project. The Clinton Avenue exist from 787 is the best way to come from the north and get to the Palace Theater(s) and surrounding dining opportunities. It's also worth mentioning that the Albany County Family Court will also be adversely affected by the proposed elimination of the Clinton Avenue exit. Isn't a day in Family Court bad enough already? How about we just remove 787, the entire length of Albany, beginning at the 787/90 interchange, and replace it with a sensible grid of ground level throroughfares that will get us all where we want to go. And, oh yeah, get rid of Empire State Plaza while we're at it. It is the root of all planning problems in Albany. 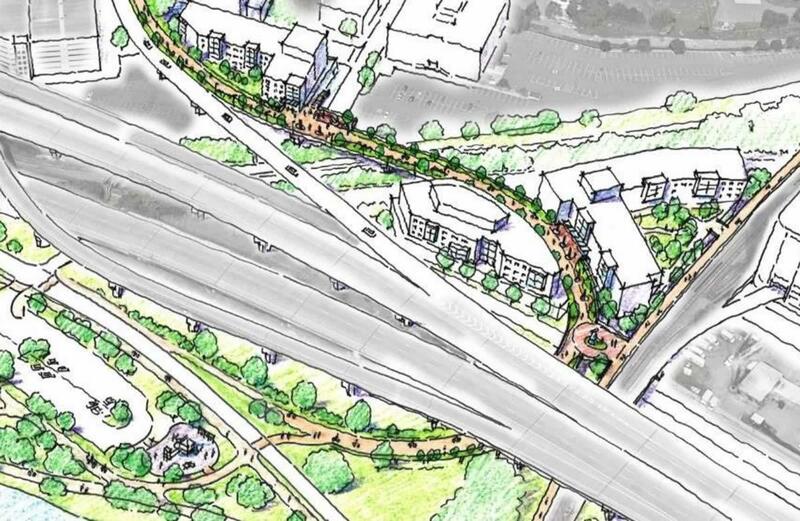 There's some confusion that pops up every time there's a post about this: the proposal does not remove the Clinton Ave exit from I-787 South. It removes the Clinton Ave exit from I-787 North, which is lightly used, and traffic that uses it already passes the alternate route that goes under the overpass onto Broadway. The vast majority of traffic using that ramp are coming from the I-90 interchange or further north on 787. That exit will remain intact. I would respectfully mention once again that equating the exit from I-787 North thru the underpass onto Broadway with the exit directly onto Clinton at Broadway (which this proposal turns into a questionable amenity for everyone) is a false equivalence (vis-a-vis drive time/aggravation/convenience) for what will be a vastly expanded user base once the new apartments just north of Clinton on Broadway at both Quakenbush and across from the Post Office come on line. Not to mention folks trying to get to the new Capitol Rep building, the Palace, other new development near there, and myself and my neighbors who live in Arbor Hill, the Ten Broeck triangle and Sheridan Hollow. It is just bizarre and seemingly unthinking to close an exit at a time just prior to the need for that exit beginning to explode. I don't disagree James, I used that ramp often when I lived downtown, and I hope to move back downtown in the future and will miss it. I do think it's true however that it will never reach the level of use that the south ramp does, so it's worth noting the difference when the confusion comes up. 787 is an overbuilt white elephant that cuts the city off from its greatest asset. It’s a multi billion dollar pit for a state far overwhelmed by capital backlog. It’s a significant chunk of untaxable, underutilized, unattractive land that creates no opportunity for the city. The access to exit is simply substituted by exiting one earlier or later, adding at peak commute one extra minute in travel time. The average daily traffic is so low, NYSDOT has no qualms about abandoning it. Thus the question, does Albany pay to keep it open, or is it utilized for the benefit of the existing and expanding residential and commercial development at its base? And what’s to come of it’s future potential, the connection between Albany and Rensselaer across the Livingston Avenue Bridge? Access to the waterfront and across the Hudson has been predominantly. been limited because of state subsidized single occupancy vehicle travel. It’s about time that some balance be restored for residents and visitors to Albany.